RIDE, PLAY AND HAVE EXCLUSIVE USE OF OUR PARTY ROOM! ALL PARTIES GO RAIN OR SHINE!! ALL ACTIVITIES CAN BE RUN INSIDE! Birthday parties, scout parties, and class trips are always a blast at the Thomas School of Horsemanship. 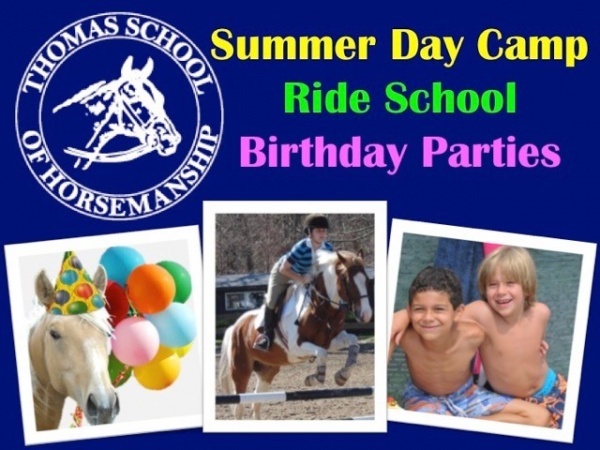 Celebrate your child's birthday at Thomas School of Horsemanship! Ride, play and have exclusive use of our Party Room! Our staff works with you to create the perfect party for your child. 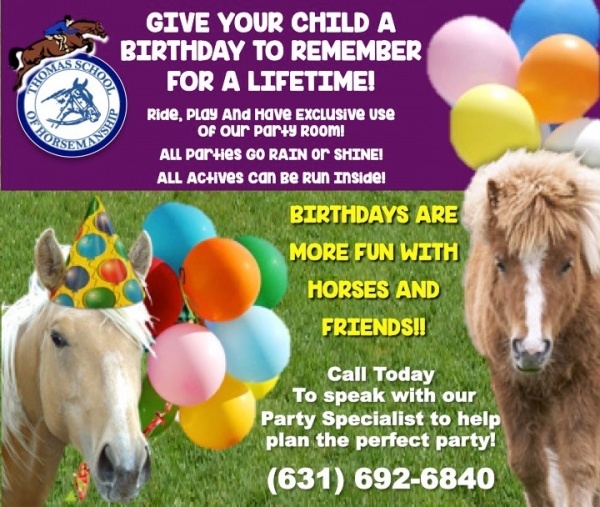 Our party package options can include: Riding time, certified ride Instructor, barn lessons, arts & crafts activity, jumping pillow, outdoor playground, privates party room for food and cake, paper goods, goody bags, invitations and thank you cards. All activities can be run indoor so, parties go rain or shine! Birthdays are more fun with horses and friends! The birthday child and their guests will enjoy riding time taught by one of our certified ride instructors who will teach them a fun filled beginner lesson. We provide the paper goods, the party room, playground, and party host so you can focus on having fun. Scouts can earn their Horse care and Riding badges. Call and speak with our Party specialist to plan the perfect outing! For boys and girls ages 3-15. We are the only Long Island Day Camp to offer all traditional camp activities PLUS a full horseback riding program. Camp gives kids the skills they need to thrive in the world. We expand the day camp experience exponentially with horses! Horses build confidence, responsibility, compassion and kindness. This combination allows us to give children a unique experience, which will help them thrive in the world! 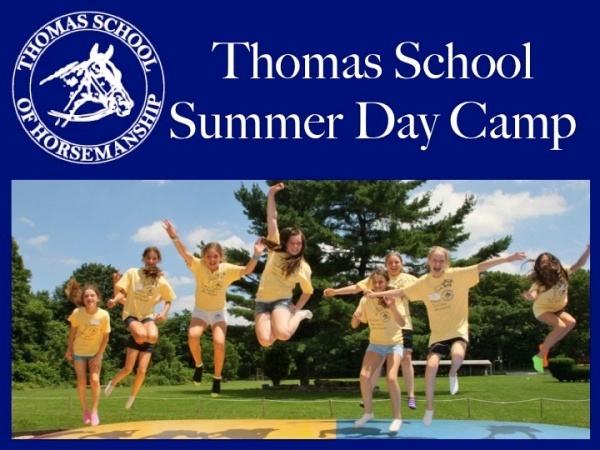 Thomas School of Horsemanship Summer Day Camp HAS IT ALL!! Our camp programs include: Sports, Arts, STEM, Red Cross Swim, Weekly Special Events PLUS a Full Riding Program! Let horses be a part of your life all year long! TSH Riding School offers lessons for all skill levels, from very beginner to those looking to compete in USEF Horse Shows. We have horses that are just right for each level of riders. Instructors are certified to ensure that safety is the first priority. Lessons are offered after school, on weekends, and mornings. Students of all riding levels are given a chance to take part in the full horse show experience at our fall and spring horse shows.